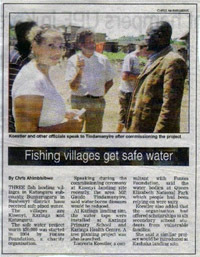 On April 6th, the water project in Kisenyi, western Uganda, was officially commissioned with a big function. The project has been running for about 1 year and 4 months, but recent improvements to the settlement tank and a tap stand gave the opportunity to an official party. The project in Kisenyi was mainly funded by Eiksmarka Rotary Club in Norway, and representatives from the Rotary Club in Bushenyi were present. District and local leaders were there, and also the water committees from the neighboring villages Katunguru and Kazinga. The guest of honour was the local Member of Parliament, Hon. Tindamanyire. Four members of the Koestler family were also present. The party for the local community lasted until morning hours, and the event even made it into the largest national newspaper in Uganda. Another improvement of the project is underway, with solar panels to power the water pump supported again by Rotary Eiksmarka in Norway. The installation of solar panels will drastically reduce the operation cost of the water project for the community, and will increase the sustainability. Since 2008, Fontes Foundation has supported the education of two teachers attached to the nursery schools at a local college. One of them is particularly interested in music, and fabricated his own guitar to play with the children. 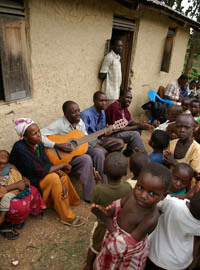 After a visit to the nursery schools in April 2009, Barbara Koestler, also a music teacher, decided to sponsor the nursery school project with a real acoustic guitar. This has improved the music teaching in the nursery schools considerably, and both teachers and students enjoy the guitar. The students that form part of the Fontes Foundation scholarship programme are growing up to become young adults and sexually active. The last years, Fontes Foundation has increasingly also supported the students with healthcare, since they are not able to benefit from education when their health is in a poor state. The question of HIV/Aids came up, and Fontes Foundation decided to test all students yearly. It was decided not to make this a criteria for selection in the scholarship programme, rather a way to make sure that the students receive the necessary medication in case infected. All students received counseling and were tested in April 2009, and all tested negative. 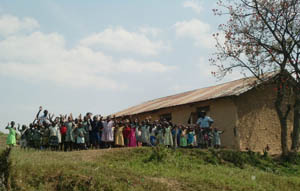 In April 2009, a new nursery school was accepted into the community based organisation (CBO) that is currently running the Fontes Foundation nursery projects in Kanungu. After an application process including a health inspection, the new nursery school was admitted. The school is in the same sub-county as the other two nursery schools that Fontes Foundation is currently supporting, and already has about 100 children. However, it desperately lacks proper classroom facilities and latrines.